With apologies to the other candidates, the big races in Eugene, Eugene Mayor and North Eugene County Commissioner, are getting down to business with only two major candidates in each. For mayor it’s Mike Clark and Lucy Vinis. For commissioner it’s Pat Farr and Tony McCown. This blog with look at the money situation. 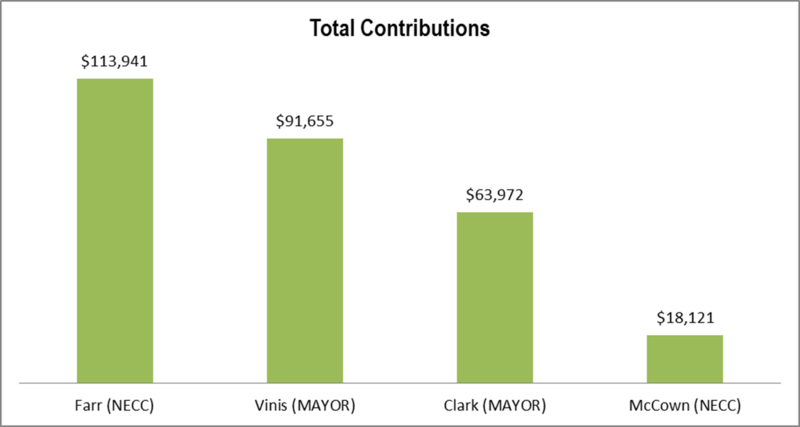 Coincidentally, Farr and Vinis have raised nearly equal amounts, less than 1% separates them. Clark and McCown are far behind. 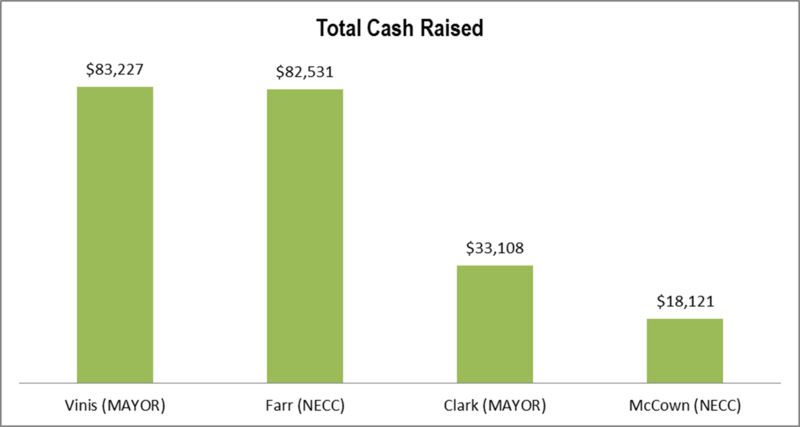 Both Farr and Clark have benefited from significant in-kind expenditures. Nearly half of Clarks contributions have come through this route. Most of these are for his campaign headquarters. The cash spent tells an interesting tale. 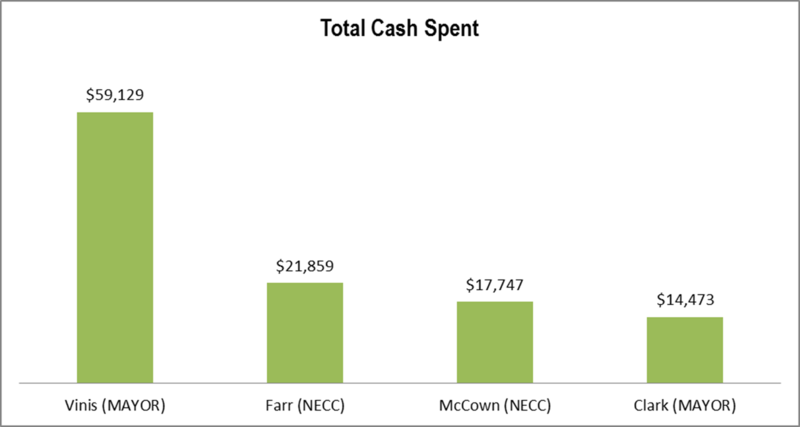 Clark, Farr, and McCown have all spent roughly the same amount of money to date. Vinis, on the other hand, has spent more than the other three combined. 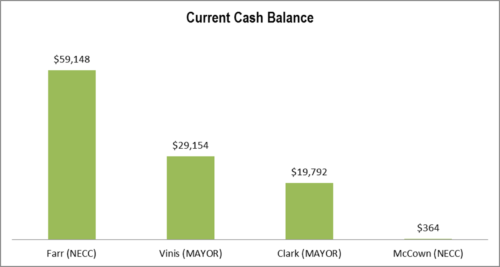 The current cash balance shows who’s ready for the final election sprint. Farr has more cash on hand than the other three candidates combined (in another coincidence he has about $19 more remaining as Vinis has spent). Clark has about two-thirds Vinis. McCown has spent nearly all his cash. On last item, Clark’s fundraising has caught fire the last week. He has raised about 37% of his total cash raised during the past week. Disclaimer: The Lindholm Company, LLC, is consulting for and has in-kinded polling to the Farr campaign. 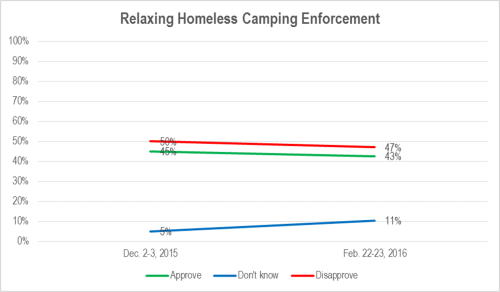 Eugeneans attitudes on homeless code enforcement has stayed about the same. 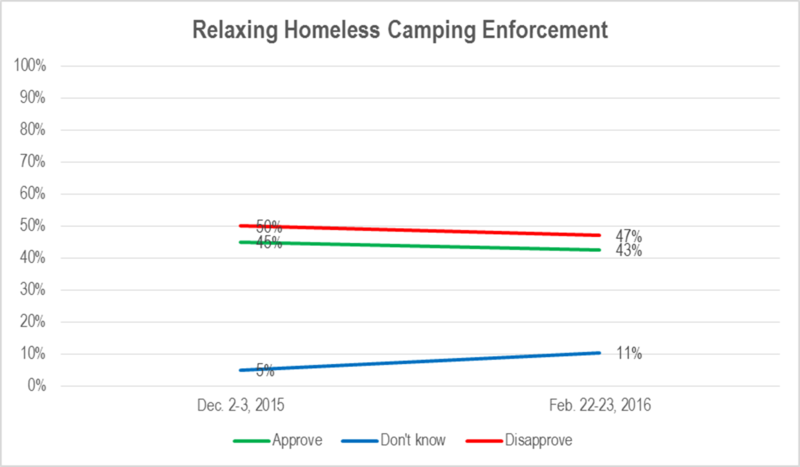 METHODOLOGY: 200 live telephone interviews of City of Eugene General Election voters were conducted on each of December 2-3, 2015 and February 22-23, 2016. The margin of error at the sample median is 7%. Totals may not add up to 100% due to rounding. Although the Register Guard and a number of activists have argued this question, the nearly one-third undecided indicates this issue hasn’t reached out among the wider Eugene electorate. N.B. This question was asked before the Register Guard editorial. 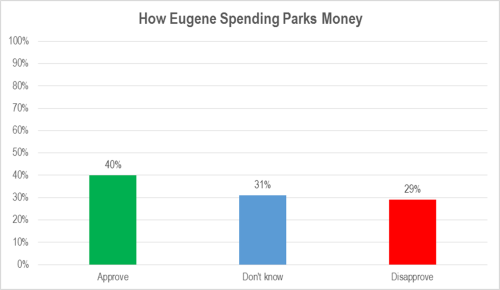 QUESTION: Do you approve or disapprove of how the City of Eugene is spending the parks bond money? METHODOLOGY: 200 live telephone interviews of City of Eugene General Election voters were conducted February 22-23, 2016. The margin of error at the sample median is 7%. Totals may not add up to 100% due to rounding.